Old Stone Books publishes non-fiction accounts of Ontario’s past, with a special focus on Muskoka’s rich history. In 1940, Germany invaded Norway. The exiled Royal Norwegian Air Force established a training camp in Canada for young recruits who escaped from the Nazis. “Little Norway” opened in Toronto during 1940 and moved to Muskoka Airport, near Gravenhurst, in 1942. Little Norway’s graduates distinguished themselves in overseas battles, flying in Norwegian squadrons of Britain’s Royal Air Force. Norwegian squadrons hunted enemy submarines off Iceland, delivered secret agents to enemy soil, and flew dangerous missions over Germany with Bomber Command. In 1943, one squadron was named the top-scoring Allied fighter squadron in all of the Royal Air Force. Canadians can be proud of their country’s assistance to Norway during a very dark hour. Torontonians and Muskokans opened their hearts to the young men. Many of the recruits married Canadian women and returned to Canada after the war. 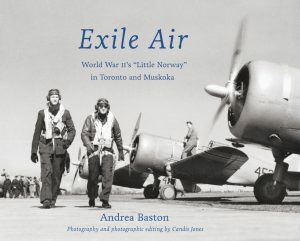 Exile Air is the inspiring story of “Little Norway” and the Norwegians who trained there.